I'm going to start this blog with a digression. I never thought of myself as a cruel child, but I wince slightly now in recounting the following tale from my formative years. When I was aged four and living (as I'm sure I've explained before) in deepest, darkest Africa, I used to collect toads and pop them into old Lyle's golden syrup tins, the lids of which my father had punctured with a few holes so the creatures could breathe. I think I must have imagined I was an intrepid explorer, scouring the continent for rare and exotic beasts and bringing my amazing finds home to base-camp, much to the wonderment of all. I was certainly in the right locale; but toads were about as exotic a trophy as a four-year-old armed with a few syrup tins could expect to ensnare; and as for the wonderment element - which is the real point of telling this story - that consisted of presenting a tin to my younger brother (aged two) and enjoying his reaction as he pulled off the lid and came forth not sweetness (as the famous logo proclaimed) but a toad, springing right up into his surprised face. It's a trick that, to my satisfaction, worked on more than one occasion. What can I say? Boys will be boys. No toads were harmed. Digression over. Take the lion in the picture. I always assumed he was sleeping contentedly (possibly after a heavy meal of treacle tart, one of my own favourites as a lad), but he is in fact dead. And those bees buzzing around his head aren't seeking out any last traces of treacle to be found on his magnificent muzzle and whiskers, they've been nesting and breeding in his corpse. Quite a shocker. Abram Lyle, founding father of the East End sugar refining company that bore his name, was a very religious man and he took that slogan from a Bible story (Judges chapter 14 if you wish to check it out), which relates how Samson on a visit to select a bride from among the Philistines once tore a young lion apart with his bare hands and on re-passing the scene some considerable time later found bees nesting in the carcass, from which he extracted honey that he took home with him. That led him to pose the following riddle to the Philistines at his wedding feast: 'Out of the eater came forth food and out of the strong came forth sweetness.' After puzzling over this for three days the guests advised Samson's new wife to get him to expound on the meaning of the riddle or they would burn the house down. Ah, the old days, the old ways! 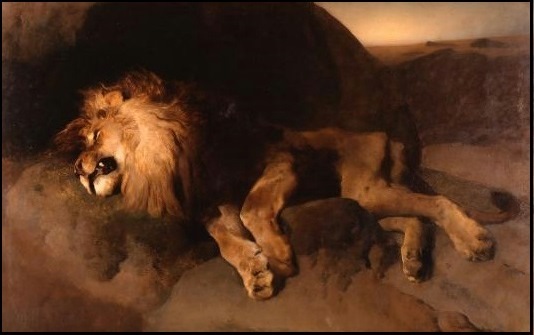 The image of the lion on the Lyle tin is based on a painting of 1849 by Sir Edwin Landseer, entitled 'The Desert' (or alternatively 'The Fallen Monarch'), reproduced below. The original can still be seen in Manchester Art Gallery. Sir Edwin was famous for his depictions of wild life in various media. His most well-known works are the sculptures of lions that stand at each corner of Nelson's column in Trafalgar Square. He was also much given to drugs and drink, suffered from depression and his family eventually had him certified insane. Abram Lyle & Sons duly merged with England's other leading sugar-refining company Henry Tate & Sons in 1921 to form Tate & Lyle. In the previous century both of the firms' founding fathers had become millionaire sugar magnates and Tate's lasting benefaction (on his death in 1899) was to the world of the arts in the form of the Tate Gallery. In a curious way, that closed a circle. I make a point of trying to avoid sugary foods, except for the occasional treat. Treacle tart remains one of my few sweet indulgences; not so easy to come by nowadays. In Egypt it's called 'palace bread' (if you ever need to ask). The finest treacle tart I ever had was at a pub in Moretonhampstead on the northern edge of Dartmoor. It was made with black treacle. That was over thirty years ago but remains a fond memory. To wrap up this week's blog, a new poem - a work in progress (so subject to change) - a somewhat caustic commentary on La Dolce Vita, a tilt at the second estate and those who possess it or aspire to it. unfolding at their precious feet. no shadow of austerity shall taint their lives. as they grow into their roles. more based on money than romance. coarse with a king's ransom might. the mystery of succession of the privileged. for their fellow residents on Quality Street. Tremendous, la. Top blogging again - great new poem. That's some offing of the Toffs! I assume you had the ERG in mind as you wrote your poem. Absolutely brilliant Steve - a funny and informative blog and a killer poem. I loved it. Sugar is a foe but our body needs it but at a good level not overboard. Great poem! That's what I call "giving it to the ruling class". A bit of a caricature perhaps but a powerful one. Good. Angry Steve is back! That's your best one since your Owen Oystains poem. Well done buddy - hope to get up to Pool for Saturday meeting. Tremendous Steve. Keep it coming my friend. Well this lived up to its billing of sweet'n'sour all right; as beautifully written as ever. I remember Lyle's golden syrup - my Dad used to stir it into his porridge. "He's not an explorer - he's a very naughty boy!" Sorry Steve, couldn't resist that. Thanks for another fascinating blog and another great slice of polemical poetry. That's a fascinating sweet blog and one hell of a poem. Toads, treacle tarts and Tories - that's quite a sweep. Well done, a great read. Love it. Keep giving them Tories hell. What's not to like? Witty, instructive and a fine poem to boot. Very good that. The blog was interesting but the poem is tremendous - specially like the lines: "with others of their ruthless kind/ they legislate to decimate the welfare state" and I hope everyone can see that is the real root of modern conservative ideology even if they wrap it all up in this one-nation make charity take the strain claptrap. Well done. Thought provoking Steve, but I prefer to celebrate how far we've come since that syrup tin, than bemoaning the era where we've all come from. Glad to learn the toads lived to grace another tin. I wonder if you could have included 'toadying' in your poem. I too loved golden syrup and have fond memories of it in flapjack and on porridge. I thought it was still on sale. I thought this was great. A funny and informative blog and a wicked poem. Thanks for sharing. I love the blog and your poem - not just well said, brilliantly said. What a witty poem! 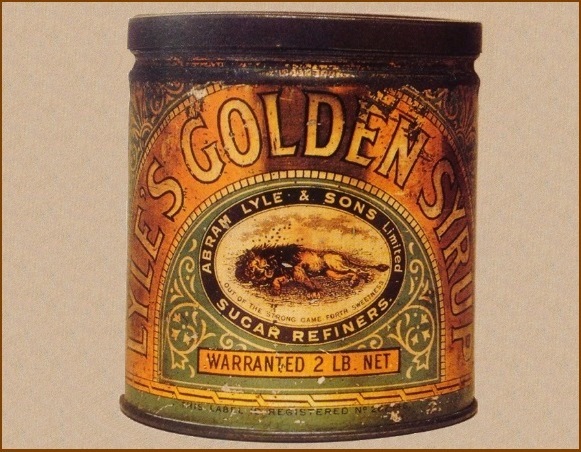 Tate and Lyle's Golden Syrup was a childhood treat and I loved looking at the design on the tin. I didn't realise that the lion was dead either - but just showing its gentle side! Wow. I heard you perform The Sweet Life at Montagues last night - a brilliant poem and a powerful performance Steve. Thanks all for the positive feedback. When I performed the poem in Preston a couple of weeks ago it was remarked that you're never too old to be an 'angry young man'. By the way, Lyle's Golden Syrup is still going strong in its iconic green and gold tin - much preferable to the squeezy plastic tube version. Such a wittily-written piece. I like the way you've captured the sense of a child's view of the world with the suggestion that the lion could be sleeping off a big meal of treacle-tart. Very funny. As for the poem, excellent. Thanks for sharing it. An interesting blog and a forceful satire. Really smart blog and some great lines in your poem. This country loses a whopping £35 billion every year in tax evasion by wealthy companies and individuals (HMRC statistic). It loses a less staggering £2 billion every year in benefit fraud (DWP statistic). The government employs over 4,000 people to chase down benefit fraud but only 500 to tackle tax evasion - nobbling the little man since forever! Steve, your blog was fascinating and your poem had me laughing out loud - Cleversods School... brilliant satire and alarmingly not as OTT as one would like to think. Bravo pal.